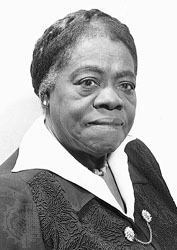 AFRICAN AMERICAN REPORTS: Lawmakers and Advocates Rally to Support Mary Bethune Statue in Washington D.C. Lawmakers and Advocates Rally to Support Mary Bethune Statue in Washington D.C.
FLORIDA-Several current and former state lawmakers, as well as members of the nation's oldest Black sorority, Alpha Kappa Alpha gathered at the state capitol today, calling on the legislature to honor the late educator and civil-rights leader Mary McLeod Bethune in the National Statuary Hall in Washington, D.C.
Bethune would replace a confederate general as one of Florida's representatives in a set of statues at the U.S. Capitol, under one proposal filed in the Senate. The legislature voted last year to replace General Edmund Kirby Smith's statue amid a backlash against confederate symbols, following the 2015 shooting deaths of nine African-American worshippers. State Senator Perry Thurston says the reasons to choose Bethune are many, adding it would be a good symbolic gesture. Last June, Bethune, who founded what is now known as Bethune-Cookman University in Daytona Beach appeared to be the favorite to replace Smith, getting the votes of all of the members of the "Great Floridians Committee".